The class has begun & the teacher opens a new chapter from the Marathi textbook. It has the famous incident of Saint Eknath. The story begins with the saint coming out of the river after bathing. As he is drying himself, a Mlencha comes near him & spits on him. The Saint doesn’t react in any way but calmly goes down to the river to bathe a second time. This time when he comes out, the Mlencha is waiting on the banks for him. He once again spits on Eknath. Eknath calmly goes to the river & bathes once more. This cycle continues for a long time. In the meanwhile, a large crowd has gathered on the banks to watch how calm Eknath was. Some appreciated his calm approach to the entire situation but most were angry beyond measure. A Mlencha - how did he dare to insult such a great man?! They stood on the banks getting angrier by the minute & whispering furiously to each other. Finally the Mlencha gets tired & falls at Eknath's feet & begs for forgiveness. Eknath forgives him. The people are amazed by this entire episode & walk off whispering to each other about what they had just witnessed. The teacher after reciting this story emphasizes to the students the importance of non - violence. Later she asks the class, "What does each one of you feel about what Saint Eknath did? Do you believe his non - violent ways were correct? Was he right in not punishing the Mlencha & letting him walk away so easily." All the students agreed that there was nothing better than non - violence. That the Saint behaved exactly as is expected from someone of his stature. It was agreed by the class in general that the story couldn't have ended in any better way. However, one student among them rose, and spoke. He boldly said that he felt the Mlencha had been let off too very easily by Eknath. Everyone fell silent. The teacher asked the student, "Do you dare to say that the Saint was wrong in what he did? Do you question his wiseness?" The student smiled & replied politely, “I never questioned the Saint's wiseness. All I said was that the Mlencha had been let off too easily. Eknath was a Saint. He did what suits him best. He remained calm in the face of provocation. He did not resort to loud screamings or verbal abuses as any commoner would have done in this situation. When the Mlencha realised his folly, Eknath forgave him immediately. However that is what is expected from a Saint. But there were people who had gathered on the banks. They were the common men, they were no Saints. What is wrong in this entire story is that the common man played the role of an onlooker when one of their reverend Saint's was being insulted. What is wrong is that they did not do their duty of stopping the Mlencha from insulting their Saint. The Saint did his duty to the hilt; however the citizens failed in their duty. Their duty was not to stand there as mere spectators & wish for the Saint to act & help himself. Their duty wasn’t to stand there getting angry & whispering like the womenfolk. Anger if channelized well can work wonders.Their duty was to punish the Mlencha & set an example for any other person who might think up of more such cheap tricks in the future." The class fell silent, some marvelling at this student’s courage to express his opinions without fear, some appreciating that this guy had dared to re - think the whole situation from a different perspective. 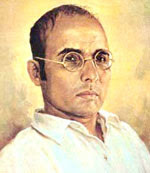 This student went on to become the legendary Swatantryaveer Vinayak Damodar Sawarkar!